Yello’s talent acquisition platform enables the world’s leading brands to deliver personalized candidate experiences to every job seeker, resulting in quality hires and faster fills. 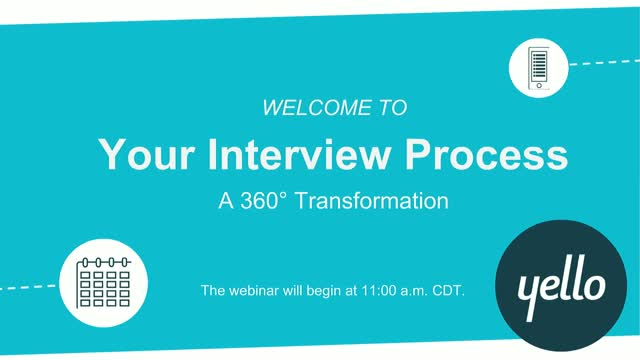 Join Yello as they explore how to transform your interview process for all parties involved! Does the interview scheduling process keep you up at night? Do you wish your team could spend less time coordinating efforts and more time having strategic conversations? Listen in as Yello examines the interview process from all angles- our candidates, our interviewers and of course our recruiters - to give you practical tips and tricks to streamline & enhance the interview process. Presenter Bio:Kelly Powers is the Product Marketing Manager at Yello, a company that builds talent acquisition software to help eliminate the gaps in the hiring experience. In her current role, Kelly leads the go to market strategy for Yello's product suite. Prior to her current role, Kelly was a Principal in Yello's solution consulting practice, serving clients in an advisory capacity on end-to-end solution architecture. With a background in Human capital consulting, Kelly has a passion for HR technology and brings a wealth of expertise leading enterprise-wide HR transformations enabled by technology.